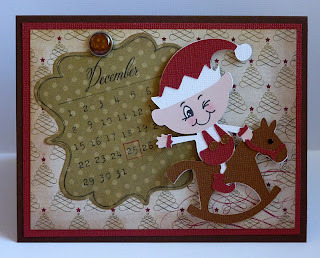 Welcome to the My Creative Time "12 Days of Christmas"! Wow! We are already up to Day 10! I hope you have been enjoying all of the great inspiration from Emma and the rest of the design team. I know I have! If you arrived here from Jeanne, then you are headed in the right direction. If not, please start at Emma's blog here. So, as you can see on my blog, I've been making lots of different Christmas cards. This is great, except that I usually like to send photo cards out to friends and family whom we don't see often. They love to see new pictures of Eric, and I think they'll really like to see how he is towering over me this year! Today I thought of a solution: I made some pockets for photo tags to put INSIDE of my cards! Remember this card, from Day 5? If not, you can click here for details. I'm going to show you what I just did to the inside of it. 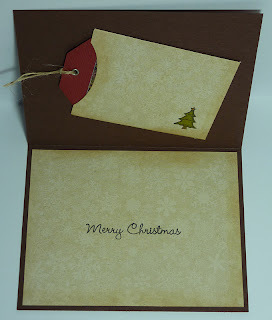 First I found some thin patterned paper that coordinated with the card but wouldn't add too much bulk. 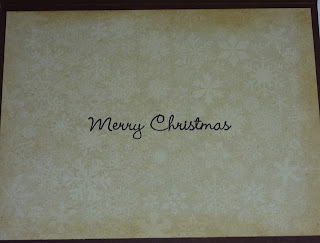 I cut a piece at 5 1/4" x 4" for the writing area of the card and stamped a sentiment from Emma's Gift Card Sentiments stamp set. To make my pocket, I took the blackout of a 7 1/2" tag pocket cut from the Cricut Tags, Bags, Boxes & More cartridge and hid all of the score marks on my Gypsy. I also slid most of the back part of the pocket off of the screen of my Gypsy so that it would not cut. I really only wanted the front of the pocket, the sides, and 1/4" of the back, so that my pocket would not add to much bulk to my card. If you don't have a Gypsy, you can make the whole pocket cut, and then just trim off most of the back. Before scoring the pocket, I inked the edges, stamped a cute Christmas tree from Emma's All Around Christmas stamp set, and colored it with Copics. I then adhered the three folded flaps of the pocket to my card with scor tape. The tag is cut at 3 3/4" on blackout, also from Tags, Bags, Boxes & More. This was the perfect size for my 2" x 3" photo. I used my Crop-a-Dile to add a hole and an eyelet, and then added some twine that can be used to pull the tag from the pocket. DCWV "Holiday Collection: The Christmas Stack"
Great job on the card and tag. What a creative idea!! Gosh your card is so pretty. I love the picture tag idea. What a fabulous idea to personalize. Your elf is way too cute. Great idea to use the photo pocket, and not only will they love the photo but that card is adorable!! Now that is an awesome idea for adding photos to cards! Super cute card and I love your idea for adding a photo. Fantastic job!! very nice, love the photo tag! That is so cute!!! Love the tag inside. What a nice way to personalize! What a great idea ... you always think of the most cleverest things to do :) Love this!! What a wonderful idea! I love the creative touch of adding the tag inside with the picture! You are doing a super job. oh my!!! I love this idea! I am so doing this this year! this is the greatest idea for pics!! love the card front too! Your photo tag card is too cute!! Its such a great idea!! Great idea and great picture. I love the idea of a little pocket for the picture, it's so adorable! What a great idea. Love the card. 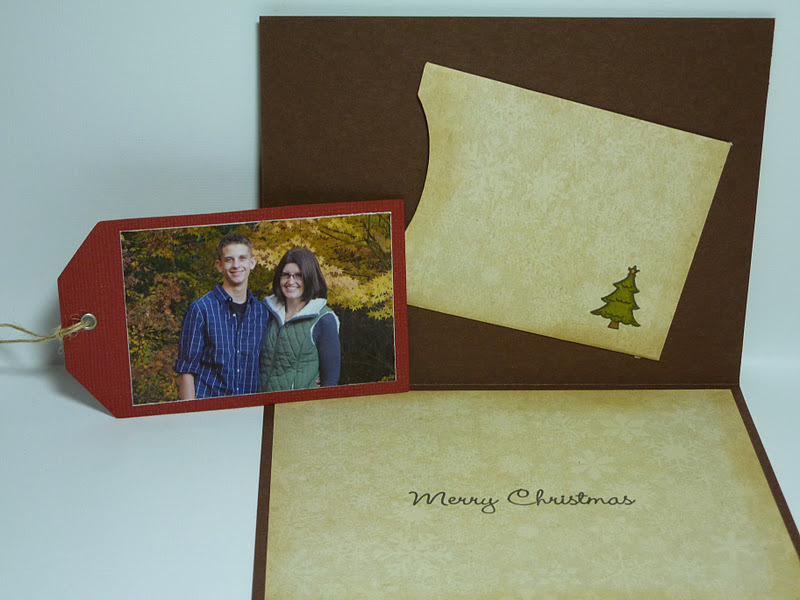 what a great idea of how to incorporate a photo in to the card! I would love to try that with some of mine, will scrap-lift this for sure! Wow, what a cool idea. Love it! Thanks for sharing. What a great way to share a cute card and a lovely photo tag. Great Idea! I love the simplicity of the tree as the embellishment. Great way to share pictures! Great idea for making a photo tag. I love your card. TFS! Katie, your pic is super adorable of you and your son! And the idea to include your pic is awesome in your cutie patootie card from Day 5. 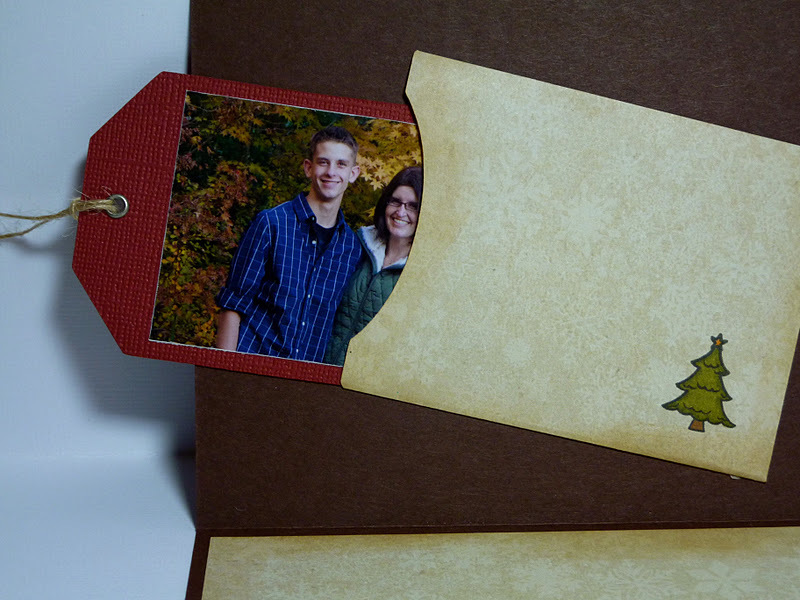 Great way to incorporate hand made cards and family photos! Awesome! Great idea...and great way to include a photo! LOVE it! That is so awesome, love the picture tag and it has a place inside the card, what a great idea!!! Awesome pic great idea with the tag. That is a fantastic idea on how to include a picture using a tag. Great picture of you and your son. A clever way to send a photo with your card. Great job! Merry Christmas to you Katie. Love, Love, Love this one. 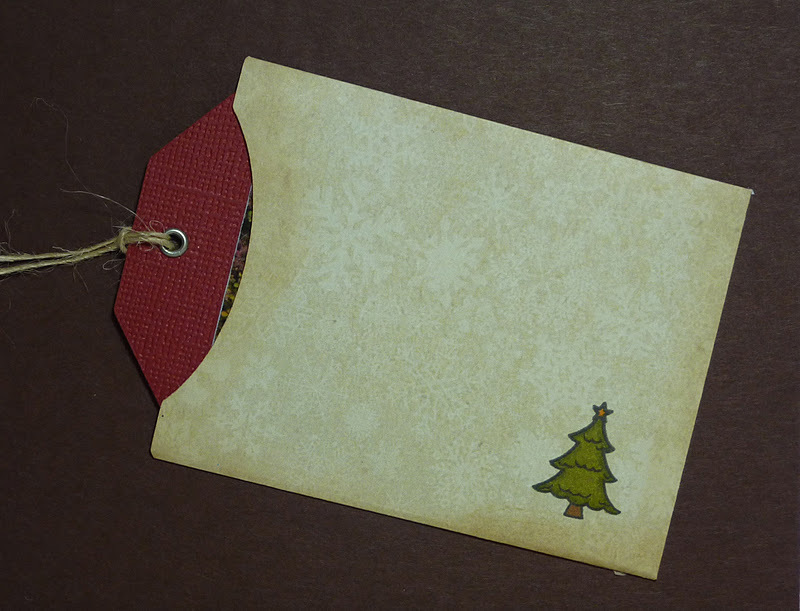 Great idea incorporating tag in the card. Love it. You are so creative. Wonderful idea! I love how you actually added it to the card instead of just leaving a loose photo in the card. From one crafty Katie to another - (With a towering son) Great idea!! Cute card! What a great idea. Great idea for a photo card! Love it! That is a great idea!! Never thought of that before!! What a great idea, I love it, thank you for sharing. Love that you added this to the card. Great idea. What a wonderful card!!! I just love the design!! Too cute, love that inside pocket! what a cute way to hide that picture! Great idea!! Wow I love this idea. What an awesome idea! I hate when the pic has been taped to the card, this works out so much better!! Great pic by the way! Very very pretty - Love the idea. This is perfect way to get photos and a card. THIS IDEA IS SOOO GREAT...LOVE THE TAG INSIDE THE CARD..AWESOME!! I love your idea for a picture holder. Thank you for sharing. Very cute card and I love the photo pocket inside. Great way to share a pic. Just says, elegant card. The tags is a great idea for photo. Very beautiful. Thanks for share with us. What a great idea for slipping in a special pic! I so love that card too. awe this is so perfect i just love it and I know who ever receives it will also love it! what a clever idea!! tfs! Super cute! I love the pockets in your cards! Brilliant idea. Very nice pic. Two treats in one envelope! I love this idea, and the colors are awesome. 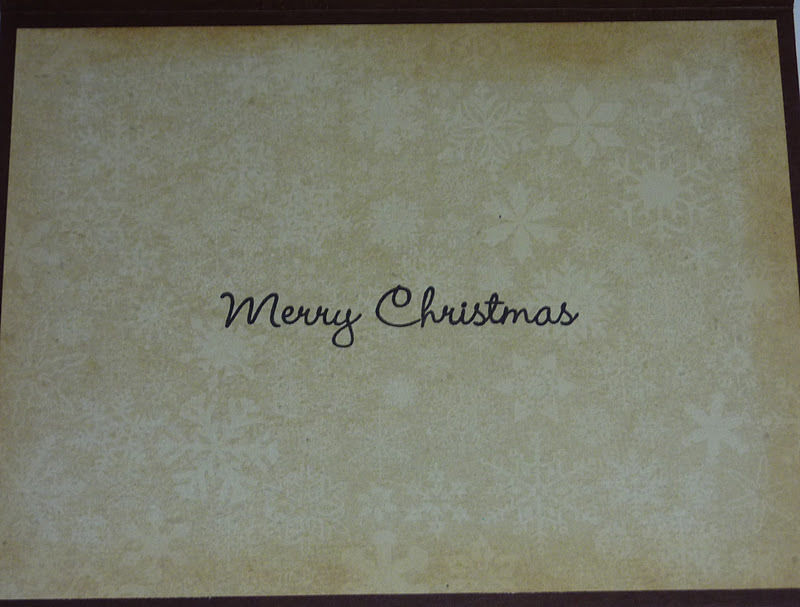 Very nice card and a great way to share a photo. Wow! I am so glad I have not sent out my pictures yet. What a terrfic idea. Now I know what to do with all those little school pictures and can double as a book marker! Thank you for the inspiration! Very creative card. Love the tag with pic. I love the way you included that picture. Very creative! great idea on your project today love the photo of you and your son. I love this idea! It really personalizes the cards with family photos! Lovely card and idea and lovely photo. What a GREAT idea!! I really love this. Great idea! Such a great way to add a picture. what a great way to sent xmas pics! What a neat idea! Looks great! Thanks for sharing. what a great idea love it . Great way to add photos to your cards. Creative as usual. Cute idea of how to put a picture in a card. My daughter, normally just sticks it in the envelope. Will have to show this to her. Love the card with the tag inside! You are way too crafty! I just love this tag idea! I don't think I'll ever have the time to be able to try all these projects that have given me so much inspiration during this hop! This is such a cute card! I love how it has a surprise inside. SO CUTE!! love how you added the pic! Great idea to add a photo tag with pocket inside the card. What a great idea for a picture. Very clever and an adorable card too. Love the tag and the card. Love the colors and pattern. CUUUUUTE pic =) Love how you made the tag on the inside...super cute!! !